Linda Johnson and her husband Bob have moved permanently to Maine, following the lead of Linda and Eliot Paine. (Do we hear a Visiting Gardens trip?) We wish them every happiness and will miss Linda sorely. Linda has generously left many of her Ikebana treasures behind for us. More information will follow. Their new address: The Highlands, 546 Governor's Way, Topsham, Maine 04086. Her phone number is 207-844-8416. Carole Obernesser has worked hard to put together a special trip to the 2019 Philadelphia Flower Show. The ticket price will include: 2 nights accommodation (double occupancy -- for $255 more you may opt for a singe room) at the downtown Marriott Hotel; exclusive, escorted early entry to the Flower Show; 2 lunches and one fine dining dinner; entry and docent fees to historic (Colonial and Modern Day) Philadelphia sites, Winterthur Museum and Longwood Gardens. The cost per person is $1460 (a minimum of 15 guests); $1390 per person (if we have 20 guests); and, $1350 per person (if we have 25 or more guests). Guests of members will be allowed. The dates are March 3-5, 2019. The Garden Club of Cleveland and the Akron Garden Club did this tour last year and loved it. Please email Carole as soon as possible if you are interested in going. Cynthia Druckenbrod's beautiful daylily won first prize at this year's Hemerocallis Society Show at the CBG. A sample of her gorgeous blooms graced our Provisional Tea in July. Thanks, Cynthia. Did you see the photos of Julie Given's lovely gardens, and the delicious treats prepared for us at the Provisional Tea in July? Go to the Photos page of the SLGC website. From Mary Anne Liljedahl: Click here for a fabulous TED talk, What Gardening Taught Me about Life. Although only 6 minutes long, it is very inspiring! From Leslie Marting: I want to thank the members of the Shaker Lakes Garden Club for the extremely generous donation to the Katharine M. Grosscup Scholarship in Horticulture. This morning I attended SEARCH, the symposium for ecological research at CBG. It's an opportunity for students conducting summer research to present their work. Last year, I met 2 young women who applied and were granted full scholarships. I met another great group today, and I'm so excited to see what the applicant pool will look like this year. 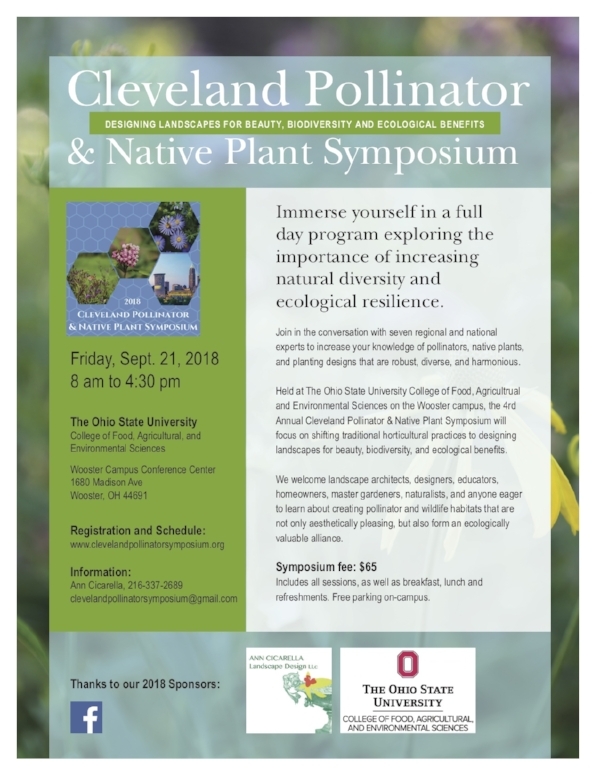 We will all have the chance to hear Keri Plevinich, a 2018 scholar from Cleveland State, at the October 16 Joint Meeting. It is a wonderful reminder of how meaningful these scholarships are to the students. September 18 from 4.30-6.30 pm. Dozie Herbruck will guide us in the use of Google Drive. For COMMITTEE CHAIRS and THE EXECUTIVE BOARD, this is a "must." In the future, we will use Google Drive to store committee notes rather than passing down bulky notebooks or boxes of papers. We hope to make this a fun way to learn some new technology. Bring your computer, ipad or smartphone to the Country Club in Pepper Pike. Wi-Fi will be available, along with some delicious nibbles and a refreshing beverage. RSVP to Mary Bruce Rae-Grant. This summer Nancy Zambie visited the Biltmore with some friends, and sent back some photos to spark our interest. Says Nancy: "Although the roses were pretty much gone, the annuals in the Biltmore Gardens in Asheville, NC, were doing quite well despite blistering heat and copious rain. The application of Chihuly fertilizer produced spectacular, if uneven, results. This fertilizer was available in the gift shop at a very impressive price." Don't forget that you can find lots of information on the Member's Only page of the SLGC website: program schedule, board meeting schedule, new provisional biographies, calendar of events, proposal form, board and committee chairs, and much more. The password is the same as last year's and can be found inside the cover in your new Directory.